Sometimes life is full of interesting irony and views of life and the world from different angle. The other day I finished my lunch and walked outside to enjoy the fresh Florida air as I walked back to the customer's office. As I walked down the side walk taking the sunshine, the fresh air, and the cool breeze I noticed a vehicle in front of me that just cried "LOOK AT ME!" 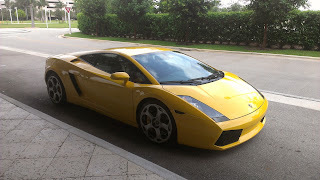 A bright yellow Lamborghini was parked at the curb just begging to be ogled and drooled over. I, of course, took out my phone and took a few pictures of this beauty for the blog. I have to say, this thing looks like it should be speeding just sitting there. The Italian's certainly do know how to made a work of art that also is functional and exciting. Several days later, as I was leaving to fly home, I walked through the parking garage and something else screamed out "Hey you! Look at me too!" 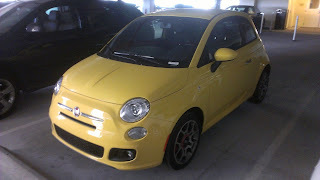 It was a yellow Fiat. A French made car that has the same general color but definitely not the same style as the "Lambo" I saw earlier in the week. The big detail in favor of this tiny little Fiat? It does use less fuel and less money out of your pocket to own it. But then if I have the money, I am probably not worried about that am I?